We all love thinking about how to decorate the home at Christmas – do we get a real or artificial tree? Where do we hang the stockings? And is an indoor snow machine ‘too much’ or not? So much thought goes into the home, the garden often gets forgotten about. There are so many ways you can decorate your outside space, especially when using lights, to help spread some festive cheer. We’ve been researching how people use outdoor lights, and pulled together our favourite ideas to help get you thinking! When doing our research, we were amazed at how creative people get in their gardens – one person even wrapped their outdoor lights around a washing line, and hung an old Santa outfit from it… of course if you’d like to recreate this, you’ll be able to get both the lights and outfit from Wilko! Another idea we loved is creating a decoration out of an old metal bucket, with logs and pine cones. Any old bucket will do – simply fill it with pine cones, small logs and tree branches, and then add a set of lights. This’ll look great either outdoors or indoors. If you’d like something quick and easy for the front of your house, our 5 foot premium crystal twig tree is ideal. The mains operated twig tree looks fantastically festive, and if it’s not quite big enough for you, a 7 foot twig tree is also available. 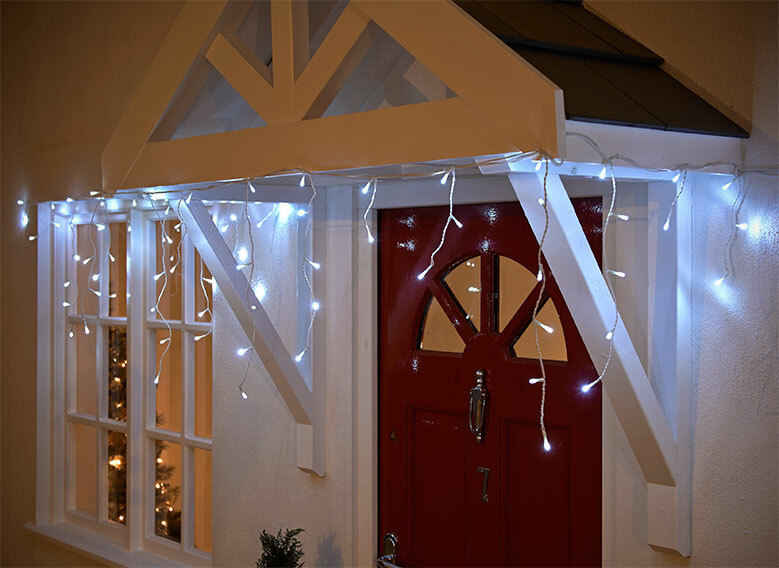 If you have a porch or canopy above your front door check out our 11.8m LED white snowing icicles. These new lights come with a timer function, so they’ll switch on automatically each day. Make them come on just before you get back from work as they’re sure to give you a warm feeling inside even when it’s freezing outside! If you’re looking to make the outside of your home sparkle with lights this year, we’ve got just the thing. Our gutter hooks are perfect for securing lights to your gutter. They’re easy to use and come in both small and large. When it comes to choosing Christmas lights, Wilko really is a one-stop-shop. We’ve got absolutely tons to choose from, from short strings of indoor lights to longer strings for bushes and trees outdoors. Visit our Christmas lights section for everything you need to make your home and garden shine this Christmas. 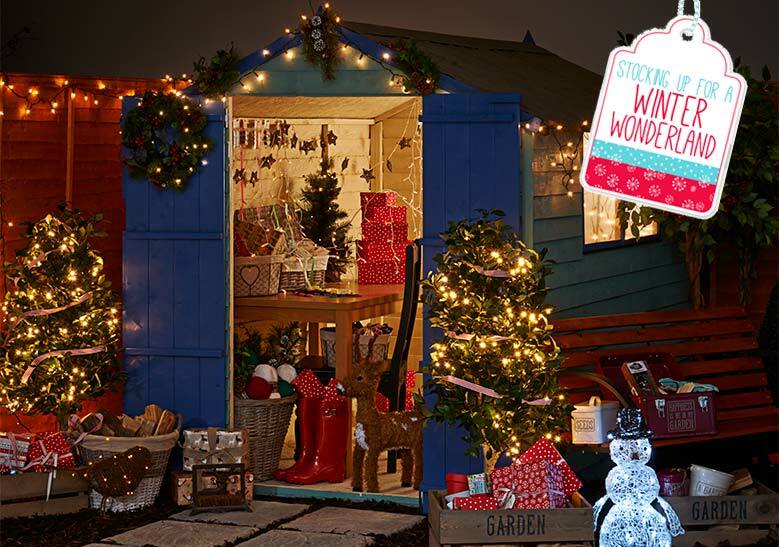 When it comes to the back garden, why not transform your dull shed into a grotto? Our set of 140 white bulb curtain lights can be used indoors and outdoors, and are ideal for draping over a shed, porch or fence for a magical waterfall of lights! 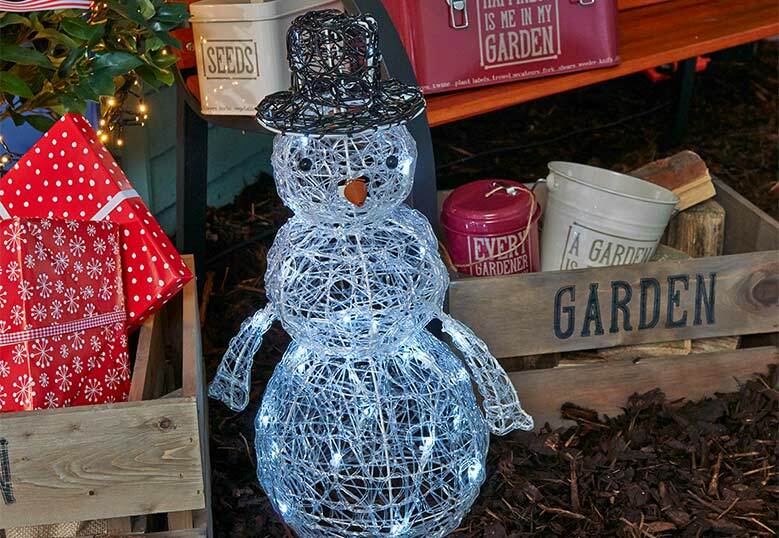 Our brilliant outdoor snowman light will look fantastic in your back garden, he can be used indoor or outdoor, and with 32 bulbs, you can’t miss it! As well as lights, we’ve got all the equipment you need no matter how big your outdoor light project is. Our 4 pack of metal stakes is really useful for securing larger outdoor lights into the ground – perfect if you’re looking to create a lit pathway to your grotto! Our 20m extension lead is just the thing if you need a really long extension lead that’s safe to use outside. It must be plugged in indoors, but will give you 20m of cable – great for lights at the end of a driveway! When the festive season ends and it comes to packing your lights away, keep them safe with our handy storage box, which is perfect for protecting your lights!